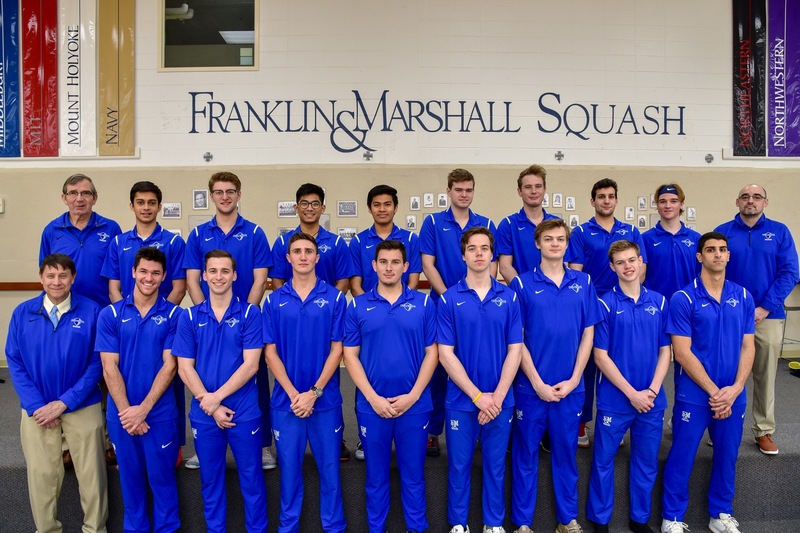 Franklin & Marshall's men's squash team enjoyed a return to national prominence in 2018-19, finishing the season as the No. 14-ranked team in the nation and competing in the Hoehn Cup (B Division) of the CSA Team Championships after a one-year hiatus. The Diplomats found success in the Hoehn Cup bracket, an annual matchup of the nation's No. 9-16 teams, with a 6-3 upset of No. 12 Navy in the Consolation Semifinals, before falling just short in the Finals by a 6-3 score to No. 14 Cornell. Overall, F&M concluded the 2018-19 campaign with a 15-8 record, good for the most wins since 2013-14 and tied for the second-best season total in history. The Diplomats closed out the regular season playing their best squash as F&M compiled an 8-2 record in its final 10 games. Three individuals represented the Diplomats at the CSA Individual Championships in early March as Sanjay Jeeva '21, Shams Abbas '20, and Aryan Parekh '22 all competed for F&M. Jeeva highlighted the trio's efforts by advancing to the Semifinals of his Molloy Cup bracket but came up just short of competing in the Championship match. Jeeva set a career high in wins with an 18-5 overall mark between the No. 's 1-2 spots in the order, while Abbas won six matches at No. 1 and Parekh produced an impressive first-year campaign with a team-leading 19-5 record playing predominantly at No. 's 4-5. Fellow first-year Matthew Dukarm '22 went 18-5 at No. 's 5-7, while Yannis Senkel '20 went 16-6 from No. 's 2-5. Frank Murray '19 led the way in the classroom after receiving his second consecutive Scholar-Athlete Award by the CSA. The honor is reserved for juniors or seniors who hold a cumulative GPA of 3.50 or higher and played a top-10 ladder position for the majority of their team's matches.